Yakumo Mega Image 85D digital camera introduction : Yakumo, a relatively new player in the digital camera world has a booth next to the bigger players like Nikon or Casio. Yakumo is an IT-related brand, but finds it interesting to launch digital cameras under their own name. Target group: entry-level users, price: EUR 70 - 149. There is one exception and that is Yakumo's latest digital camera, the Yakumo Mega Image 85D. Still targeting at the entry-level user, but carrying a price tag of around EUR 249. The new Mega Image 85D digital camera has just been introduced and in fact has just arrived at the Yakumo booth. This IFA day was nearly ending, I was on my way back to get a cab, but decided to spend some time with this new Yakumo digital camera. Mega Image 85D - 5 Megapixel : The new Yakumo Mega Image 85D is an entry-level digital camera for those who need easy photography but also like to be creative. The new Mega Image 85D is the most versatile digital camera from the Yakumo series of digital cameras. The Yakumo 85D provides built-in scenes and has a comfortable grip to enable handling the camera in a convenient way. Of course we may not claim that this digital camera has the most up-to-date innovations on board, but there is a growing market out there that is not willing to pay more than Euro 250 for a (2nd) digital camera. LCD display of 1.6-inch. 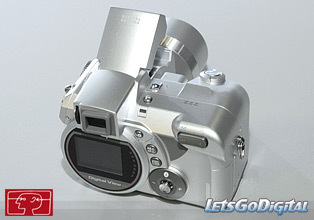 The camera uses 16MB internal memory or an external Secure Digital or MultiMedia Card to store the images or video clips. 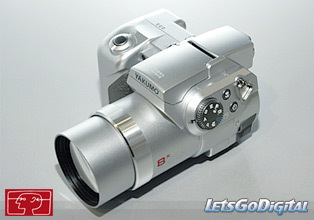 The Yakumo Mega Image 85D offers 8x optical zoom and 4x digital zoom. The focal length is 39 - 214mm (equiv. 35mm camera) and the 85D camera is able to focus from 20cm in Macro mode and from 50cm in Normal mode. Those users wanting more creativity can select aperture or shutter speed manual. The aperture range is f/2.8-5.58 in wide and f/3.41-6.82 in tele, shutter speed range is 16 sec - 1/2000 sec. The Yakumo Mega Image 85D also offers adjustable white balance settings and flash settings. Yakumo Mega-Image 85D - JPEG and MPEG4 : Besides capturing high resolution photos the Mega Image 85D digital camera is also capable of recording video clips in MPEG4 format. The resolution is only 320x240 pixels with sound. 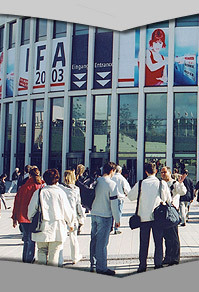 The JPEG and MPEG4 format photos and clips are transported via the USB cable. 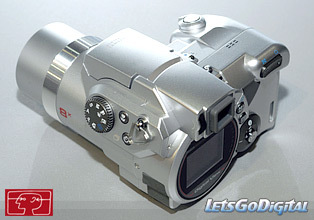 The Video interface enables the Yakumo 85D digital camera to connect to a TV and start a slide show, etc.